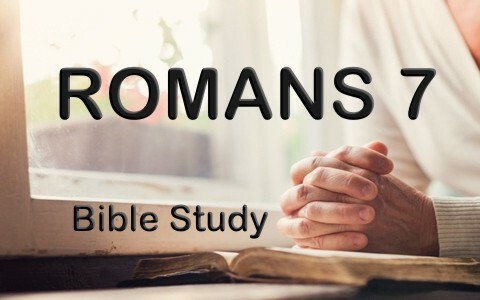 Here is a Romans chapter seven Bible study with commentary. The Apostle Paul uses the comparison of being married until death parts them and they are legally free to remarry to that of being freed from the law and the penalty of it because “the law is binding on a person only as long as he lives” (Rom 7:1b). It is just like “a married woman is bound by law to her husband while he lives, but if her husband dies she is released from the law of marriage” (Rom 7:2) and again, as if to emphasize his point, “if her husband dies, she is free from that law, and if she marries another man she is not an adulteress” (Rom 7:3b). Paul uses this to point out the fact that “you also have died to the law through the body of Christ, so that you may belong to another, to him who has been raised from the dead, in order that we may bear fruit for God” (Rom 7:4), something very similar to what Paul wrote in Romans chapter six (Rom 6:21-22). The problem wasn’t with the law, in fact the law helped us since “while we were living in the flesh, our sinful passions, aroused by the law, were at work in our members to bear fruit for death” (Rom 7:5) but “now we are released from the law, having died to that which held us captive, so that we serve in the new way of the Spirit and not in the old way of the written code” (or by the letter of the law) (Rom 7:6). The law of God was never the problem…it was those who by their very nature broke the law and that would include me and you. Paul, having the foresight to anticipate their question about the law asks, “What then shall we say? That the law is sin? By no means! Yet if it had not been for the law, I would not have known sin” (Rom 7:7a). In other words, the law showed Paul and us that we are sinners and can never be able to save ourselves. The law should make us run to the cross. Paul would not have even known sin “if the law had not said, “You shall not covet” (Rom 7:7b) and so “The very commandment that promised life proved to be death to me” (Rom 7:10) since we’re all guilty before it. It isn’t the law that’s the problem but the truth is, “the law is holy, and the commandment is holy and righteous and good” (Rom 7:12). Furthermore, “It was sin, producing death in me through what is good, in order that sin might be shown to be sin, and through the commandment might become sinful beyond measure” (Rom 7:13). Have you ever done something wrong, knowing it was wrong, and did it anyway? I would be shocked if someone answered no because even the Apostle Paul struggled to do what was right and sometimes choose to do what he knew wasn’t. Paul writes “For I do not do what I want, but I do the very thing I hate” (Rom 7:15b). I must raise my own hand on that one. Just like Paul, “I know that nothing good dwells in me, that is, in my flesh. For I have the desire to do what is right, but not the ability to carry it out” (Rom 7:18) and as a result, “I do not do the good I want, but the evil I do not want is what I keep on doing” (Rom 7:19a). Maybe it’s just my human nature, but I find comfort in the fact that Paul struggles just like I do with sin. What I want to do, I don’t do and what I don’t want to do, guess what? I do it! What about you? I would never call someone a wretch…well, maybe I would call myself that and actually, I have because it’s true. Since it was true of Paul, who wrote what a “Wretched man that I am! Who will deliver me from this body of death” (Rom 7:24), it must also be true of us. Paul doesn’t leave us in despair and hopelessness. He answers the question of Who would deliver him from this body of death and his answer is, “Thanks be to God through Jesus Christ our Lord! So then, I myself serve the law of God with my mind, but with my flesh I serve the law of sin” (Rom 7:25). Yes, we are delivered by Christ from the penalty of our lawbreaking (or sin), but in my flesh, and I would imagine in your flesh, you still tend to serve the law of sin. It’s just in our nature. Who hasn’t been through the same struggles that the Apostle Paul went through? I don’t know of any Christian who hasn’t struggled with at least something, but there’s joy in the struggle because if you’re endeavoring to overcome sin, you know that God’s Spirit is in you and working through you. It won’t be easy, but if you are struggling with your flesh, just like me, then at least you know you’re not being a slave to sin. It’s good to be in the battle because you know you’re on the right side; His side. Any old dead fish can float downstream. It is only those fish who swim against the current of the flesh, the world, and the pride of life who will survive, but even these are to the glory of God because He has caught you and He has bought you. Good reading, I enjoy it very much! Thank you! Previous post: What Does The Bible Say About Sexual Desire?